In the wake of repeated police shootings of unarmed Black men and women, police departments across the country are focusing on de-escalation. Yet federal courts reviewing Fourth Amendment excessive force violations are often unwilling to take into account how an officer’s pre-seizure conduct may have affected the need to use force during a civilian encounter. 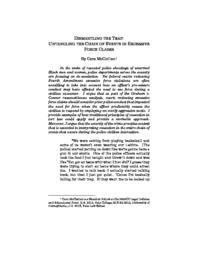 I argue that as part of the Graham v. Connor reasonableness analysis, courts reviewing excessive force claims should consider prior police conduct that impacted the need for force when the officer predictably causes the civilian to respond by employing an overly aggressive tactic. I provide examples of how traditional principles of causation in tort law could apply and provide a workable approach. Moreover, I argue that the severity of the crime provides context that is essential to interpreting causation in the entire chain of events that occurs during the police-civilian interaction.